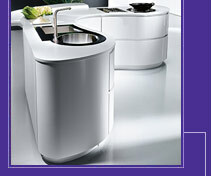 Cantrio Koncepts is a unique product supplier specializing in bathroom and kitchen sinks. Constantly evolving, developing and creating Cantrio Koncepts is offering the consumer a full range of glass, stainless steel, copper, nickel, porcelain, marble / granite, and wood vessels. Distinctive range of bathroom vanities and Stainless Steel kitchen sinks that appeal to both traditional elegance as well as contemporary style. Bringing distinct concepts to consumer, Cantrio Koncepts products luxury at an affordable price.